Very Positive (1,388) - 94% of the 1,388 user reviews in the last 30 days are positive. Overwhelmingly Positive (130,356) - 96% of the 130,356 user reviews for this game are positive. With the recent announcement of Sardinia, many from our community thought this would be the biggest addition to come in the 1.35 update. We'd like to contest that claim, as another part of the Germany rebuild is arriving in this update as well! This time, our map design team has been focusing on east and south-east areas of Germany, and they really haven't been holding back! Check out the change list to see for yourself! 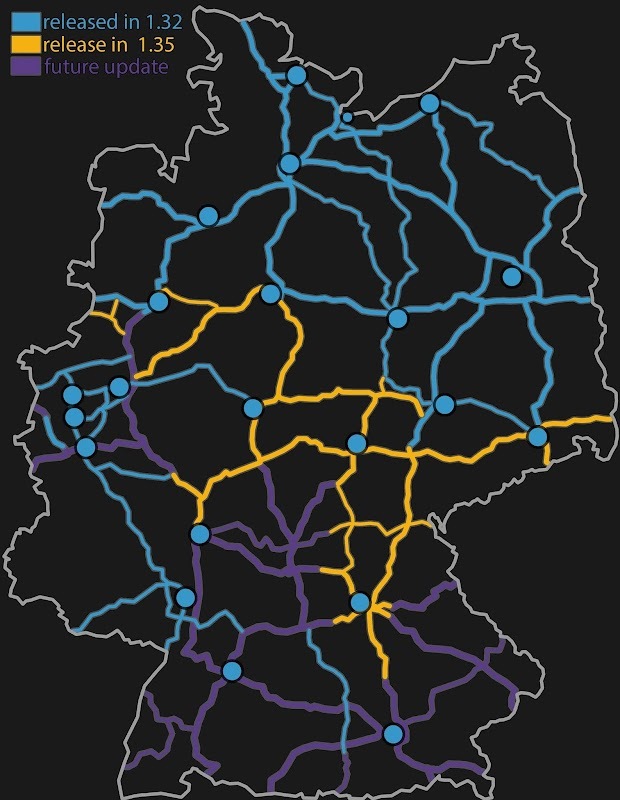 Over 2000 km in-game kilometers of reconstructed roads. When we first teased an image of this location, we received quite a number of accurate guesses from our community, with one person guessing within 2 kilometres of where it was taken. So where exactly are we talking about? We are excited to announce that the island of Sardinia will be added in the upcoming update 1.35 as a free addition for the Italia map expansion for Euro Truck Simulator 2. Sardinia is the second-largest island found in the Mediterranean Sea, which means you'll need to take a ferry to the port of Cagliari from either Napoli or Palermo to get there. On the island, you'll find three new cities - Cagliari, Olbia, and Sassari, where you will find the famous church of Santa Maria of Bethelem, and a number of smaller villages, hidden amongst vineyards and olive-trees. As with most islands, you won't find any highways there, but many smaller rural roads. So if you enjoy a drive on curvy roads with meandering climbs and beautiful coastal views, there's a good chance you will want to relocate your company to this Mediterranean pearl. 1,457 Curators have reviewed this product. Click here to see them.